This past weekend I had the privilege of cooking a brisket for a friend's party. My philosophy about cooking, as corny as it sounds, is that each meal is a gift on a plate. So, to me occasions like this are a cherished thing. I always look forward to opportunities to share what I love with family and friends. On this particular occasion my friend from work, Beverly, asked me to cook a brisket for her friend Winnie's birthday. Herein lies the BBQ cook's paradox. Why is it that I can't cook in competition the way I do in the comfort of my backyard? Why is it that, at a competition, no matter how much I try to tell myself, "Just relax and do what you do. ", it rarely works? Why do I over-think things and change what I do on-the-fly in the endless pursuit to please six judges? This particular brisket cook followed the pattern of many more before it. There was no pressure of a turn-in or judging, and it ended up being one of the best briskets that I've ever cooked. It's a bittersweet situation that, at least for me, is much more sweet than bitter. Pleasing real folks with real barbecue that is prepared with love and care is what it's really all about. I thank Beverly for the opportunity to serve her guests, and I can tell you that the outpouring of accolades from her friends, and especially the very sweet e-mail that I received from the guest of honor, Winnie, are worth much more to me than a trophy. And that's not because it made me feel like some sort of brisket hero, but because it brought an extra measure of joy to the occasion. I was humbled, happy, and proud to have had the opportunity. Note: Yes, that is the actual brisket pictured above. I shot that about 45 minutes before I pulled it off of the cooker. 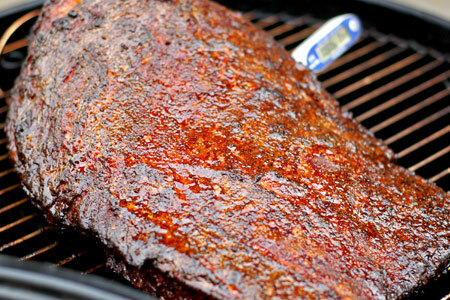 When are you going to do a Brisket training class? That looks like a fantastic Brisket. I guess I'll have to fly out to Idaho and attend one of your classes! this looks amazing! Maybe you should get a KCBS event running in your backyard? ha ha.